The Neurological Rehabilitation VR project at the Neurological Recovery Center in Fort Worth, TX, is using a customized GeoDome Panorama with their OptiTrack Motion Tracking system. 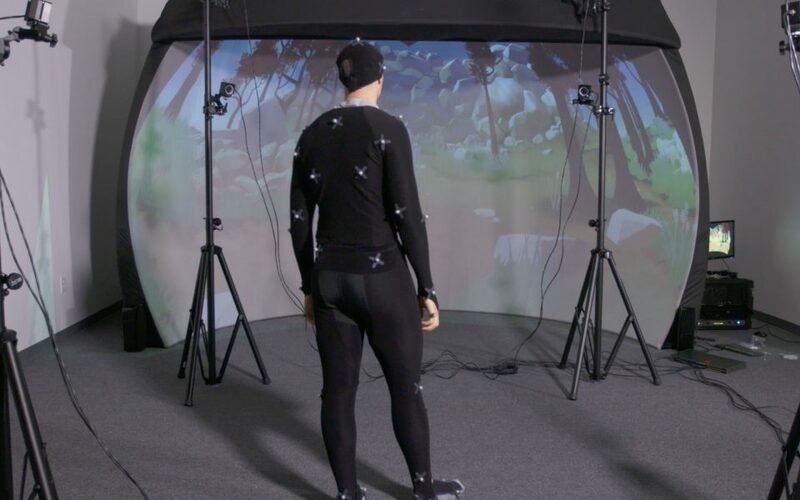 They’ll be creating customized virtual reality games for upper and lower body stroke rehabilitation using the motion tracking system and the GeoDome . Using the OptiTrack system, each patient’s full body can be tracked and the motion data synced to an avatar that they can see on the GeoDome screen in real time. The embodiment of the virtual avatar with that of the patient is crucial for success of the therapy. “The GeoDome’s height and field of view lets us to display the patient’s avatar in true scale to their body on the screen, and he or she can interact with the virtual objects like they would in real life. The curved display and resolution of the screen helps to immerse the patients in the task/game they are performing and therefore enjoy their therapy sessions,” said Veena Somareddy. Copyright 2019 The Elumenati, LLC.